Twickenham will host the final on Saturday, 31 October with the most expensive seats to be sold at £715. However tickets for some pool stage matches will cost as little as £7. 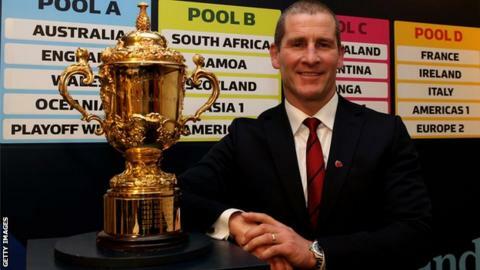 All England's pool matches will kick off at 20:00 BST, including the opening match at Twickenham on Friday, 18 September. Organisers England 2015 promised last year to make the tournament "affordable and accessible to everyone". A total of one million of the 2.3 million available tickets will go on sale at £100 or less, with 500,000 selling at £50 or less. Adult ticket prices start at £15 for pool matches and child tickets will be available from £7 at 41 of the 48 matches. England 2015 chief executive Debbie Jevans said: "For £70 a family of four can watch Australia. Indeed for £130 a family of four could watch England playing in Manchester. "But to achieve that we have never shied away from the fact you do have to raise those revenues to put on the event. "Therefore, at the back end of the tournament, £750 is our top price for the final, which some may say is expensive but equally that does compare with previous World Cups." The first batch of tickets - around 500,000 - will be distributed through clubs affiliated to the Rugby Football Union next May and will include some for the final. The general sale launch begins in September and there will be a ballot system in place for oversubscribed matches. Unsold tickets will be made available through Ticketmaster from December. "We wanted to take this event to the whole country and we have done that," added Jevans. "And then to encourage those fans you have to make the prices accessible and affordable to do that, and that is what we have done." Eight football stadiums, including Wembley and Villa Park, will be used to host games along with the Olympic Stadium. Wales will play games at Cardiff's Millennium Stadium in addition to facing England and Australia at Twickenham, while Kingsholm in Gloucester and Exeter's Sandy Park are the only other rugby venues in use. Kick-off times for group games will be midday, 14:00, 17:00 and 20:00, and for the quarter-finals and semi-finals 17:00. Jevans said: "Our key priority is ensuring we give the teams a balanced and equitable schedule, which we believe we have achieved. "We have consulted with all our transport providers, our venues and host cities, and we feel we have put together a schedule that takes into account all of the needs of our stakeholders. "Now that fans have the final piece of the jigsaw, they can start to plan their tournament, be it in stadia or watching from home, and make this a truly memorable celebration of rugby."